The field of otolaryngology is a large field that encompasses many specialized sub-fields. Otolaryngology clinical trials therefore study a wide variety of causes, diagnoses and treatments for different conditions that affect the ear, nose, throat, head, and neck. Some of the most common and familiar of these ailments include allergies and sinusitis, but the field spans the gamut to other things like head trauma and cancers that are found in the head, nose and throat. Areas of the ear that can be affected by disorders include the inner, outer, middle ear and the ear canal. If you have been diagnosed with one of these disorders you may qualify to participate in an otolaryngology clinical trial. Otolaryngology is a field of medicine and surgery that deals with ear, nose, throat, head and neck disorders. Its official name is otolaryngology-head and neck surgery. 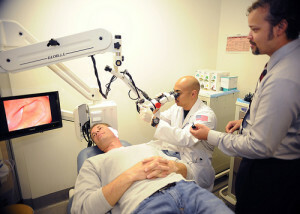 There are many specialty areas of study within the otolaryngology field. These include pediatric otolaryngology, neuro-otology and facial plastic surgery. Otolaryngologists often deal with conditions such as cleft lip, vascular malformations, cochlear implants, dizziness, snoring, allergies, and sinusitis. Head and neck ailments specifically include oral and thyroid cancer, as well as head trauma. Otology/neuro-otology deals with dizziness and hearing loss. Rhinology is the branch of otolaryngology that handles empty nose syndrome, allergies and sinusitis. Laryngology is the field that diagnoses and treats laryngitis and tracheotomies. Facial plastic and reconstructive surgeons perform operations like facelifts, brow lifts and genioplasty.